The status of DC’s Vertigo line continues to be a big question mark, but things look to be picking up for the mature-readers imprint over the summer. Astro City will be returning as an ongoing series in June along with a new 100 Bullets miniseries, and Jeff Lemire will be writing and drawing the new miniseries Trillium in August. Vertigo’s big summer begins with The Wake #1 (Vertigo), a sci-fi horror series by Scott Snyder and Sean Murphy that takes inspiration from the legend of the Kraken and films like The Abyss to create a chilling story about the horrors that lurk underwater. With American Vampire on hiatus, it’s nice to see Snyder on a book without any sort of editorial restrictions, and his script for The Wake is some of his most focused comics writing. The Wake begins with a short prologue 200 years in the future, then jumps to the present for the majority of the story before going back 10,000 years for a cliffhanger that suggests things are about to get very bad. In the present, Dr. Lee Archer is a divorced marine biologist who lost custody of her son for mysterious reasons, hired by the Department Of Homeland Security to investigate a deadly sea creature locked up in a secret underwater oilrig in Alaska. One of Snyder’s greatest strengths is his ability to create tension, and he begins the issue with a magnificent action setpiece before quickly switching gears to establish Archer’s situation and build a sense of comfort that will be torn apart by the end of the issue. The Wake is a sprawling narrative given appropriate scope by Sean Murphy’s stunning visuals, which capture the desolation of future cities submerged in water along with the calming beauty of the open sea. Avoiding the heavy narration that has characterized much of his work, Snyder lets the dialogue and artwork do the heavy lifting. Punk Rock Jesus revealed the massive scope of Sean Murphy’s talent as both a writer and artist, and his strengths as a storyteller allow Snyder to relax his writing. When From Hell debuted in the Taboo horror anthology in 1989, the series was largely treated in the comics community as a minor project in comparison to what was supposed to be Alan Moore’s next masterwork: the sprawling, serialized slice-of-life graphic novel Big Numbers. But Big Numbers suffered behind-the-scenes complications and stalled out after two issues, while Moore and artist Eddie Campbell kept plugging away on their retelling of the Jack The Ripper saga, keeping From Hell alive as its own standalone periodical after Taboo folded. The series was completed in 1996 with little fanfare, and the muted reaction continued when Moore and Campbell published a chilling 1998 epilogue that tied the whole phenomenon of the Ripper mystery to life in the 20th century. Not until From Hell finally came together under one cover as a complete graphic novel in 1999 did it start receiving its due as one of the medium’s greatest achievements: a complexly plotted, masterfully rendered dissection of Victorian society and the base origins of evil. Art Baltazar and Franco have become two of the most reliable names for all-ages comics, and while it’s nice to see them attached to a mainstream DC book, asking them to revive an obscure Silver Age property seems like a bit of a slap in the face. 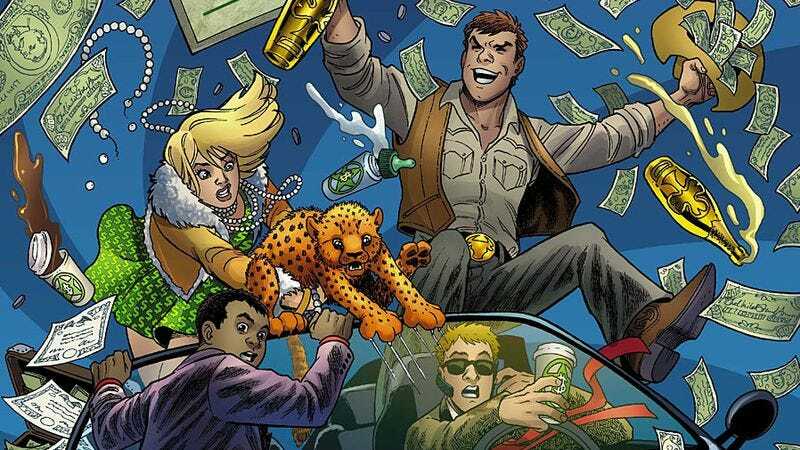 The fact that they’re able to make The Green Team: Teen Trillionaires #1 (DC) such a fun and engaging first issue speaks to their talent, and it’s a far more successful debut than The Movement, DC’s other Occupy-inspired teen title that landed in May. The Green Team is a group of filthy rich teenagers who have taken it upon themselves to fix the world, even if that means becoming superheroes to do it. Baltazar and Franco use prince Mohammad Qahtani to introduce new readers to the world of the book, bringing him to a clandestine exposition that the Green Team attends to procure the latest technology. As he makes his way through the room, he meets Green Team leader Commodore Murphy and his companions: movie star Cecilia Sunbeam, oil heir J.P. Houston, and J.P.’s cute sister Lucia Lynn. The exposition can get clunky and some of the teen dialogue is dated (who uses “crunk” anymore? ), but the writers give each character a distinct personality and set a strong course for the future of the series. The pace picks up considerably once the exposition is attacked by a group of middle-class thugs who aren’t pleased with the unequal distribution of wealth in this country, showing how the writers are going to incorporate superhero action into a story that is largely about rich kids trying to better themselves and the planet. There’s a moment early in Ulli Lust’s magnificent memoir Today Is The Last Day Of The Rest Of Your Life (Fantagraphics) in which Lust and her friend Edi find themselves in the Austrian wilderness, making their way toward the Italian border, and the two teenage punks suddenly realize just how far from home they really are. Lust’s book is set in 1984, and tracks Ulli and Edi as they spontaneously decide—the way only obstinate young folks can—to blow off the Vienna winter and go take a dip in the sea. But with no money and no passport, they’re soon off the road and in the woods, dealing with steep mountains, darkness, and impassable bramble. Lust discovers that while it’s fine to make homemade anarchy tattoos—and to scoff at the idea that any authority can prevent a person from hitch-hiking hundreds of miles to the beach if she wants to—that spirit of independence doesn’t make it any easier to be cold and exposed in the middle of nowhere. Today Is The Last Day Of The Rest Of Your Life starts out as an off-the-map travel guide, then develops over the course of its 400-plus pages into a waking nightmare. Ulli and Edi fashion themselves as self-sufficient and sexually liberated, looking forward to the adventure of living off their wits while partying all night with hunky Italians. But Lust learns that there are good sides and bad sides to being a young woman with no resources in a foreign country. Everywhere she goes, men are willing to supply her with enough free food to stay alive, but after dark those same men swarm around her, unwilling to take “no” for an answer. Eventually, Today Is The Last Day Of The Rest Of Your Life takes the form of a post-apocalyptic horror story, wherein the heroine ekes out a meager existence by day and then fights off monsters by night. The book takes an even darker turn when Ulli and Edi both land in Sicily, and find themselves beholden to the Mafia.